The daddy longlegs spider subfamily Ninetinae is composed of currently no more than 31 described species. Most are small to tiny cryptic ground-dwellers and restricted to arid habitats in the New World, Africa, and the Arabian Peninsula. As a result, Ninetinae are poorly represented in collections, fresh material for molecular work is barely available, and almost nothing is known about their biology. Ninetinae (above), and ‘typical’ Pholcidae of other subfamilies (below). At the same time, preliminary data show that Ninetinae do deserve special attention in several respects: (1) they seem to be ‘basal’ within Pholcidae and thus crucial for reconstructing the evolutionary history of the family; (2) they differ from other Pholcidae in many ways, including morphology (e.g. leg length, sperm morphology), biology (e.g., web building, female sperm storage), and ecology (e.g., arid habitats). However, their exact phylogenetic position could not be resolved in a Sanger-based six-gene analysis; only a single species has been studied with respect to sperm morphology; all we know about Ninetinae biology comes from anecdotal field observations. Typical habitats of Ninetinae (left: Brazil, right: Oman). In stark contrast to most other pholcids, Ninetinae tolerate extreme aridity. The present project aims to unravel the evolution of these enigmatic spiders in a large collaborative effort. 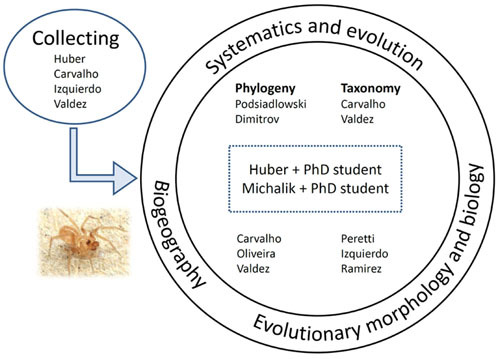 We will combine the expertise of a team of ten people in five countries and apply state of the art methodology in three interconnected fields: systematics and evolution, biogeography, and evolutionary morphology and biology.